This month we are delving into the realms of fairy tales and dreams with Danish illustrator Kay Nielsen. Influenced by the theater, the design of the Art Nouveau movement and woodcuts from China and Japan, his stylized illustrations were popular during the Golden Age of Illustration. Which direction will your jewelry take this month? Will you pull from the opulent patterns of the dresses? Play with silk ribbon and floral beads inspired by the Princesses? Will you explore the repetitive elements of the tall trees using wire or gather beads mimicking the branches and leaves cascading down from the forest canopy? Will you mix the dark tones of black and grey with the pastel tones of peach, coral, lavender, greens and warm cream hues? So many directions to go, I can't wait to see what you create! 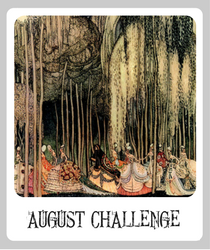 Kay Nielsen was commissioned to illustrate Twelve Dancing Princesses and Other Fairy Tales, written by Author Quiller-Couch. It was one of these illustrations that is our featured artwork for this month. His work was mainly watercolor and pen, focused on detailed and stylized design. His most celebrated illustrations where for the book East of the Sun and West of the Moon. Nielsen's work has a theatrical quality. No doubt influenced by his parents, who were well-known Danish actors, and his work on designing sets for theater productions during WWI. In his later life he moved to Hollywood and worked for Walt Disney, most notably on Fantasia. Born in 1886 in Copenhagen, he was tutored at home after the age of 12 and then taught art at a traditional academy. While living in London in 1912 his illustration career took off with a series of book commissions. 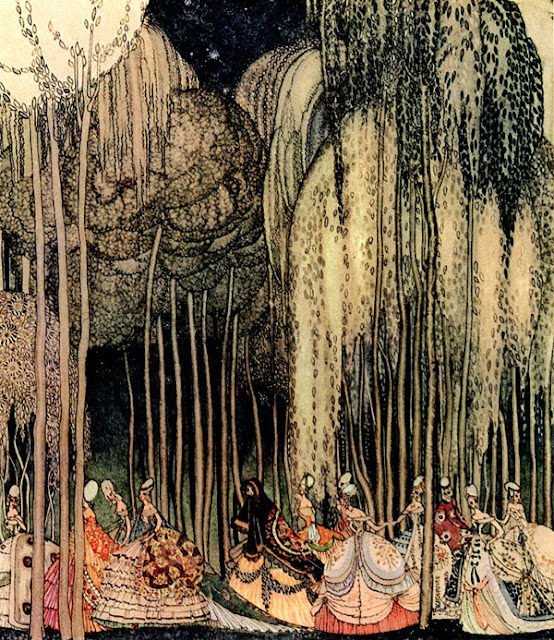 He illustrated tales by Hans Andersen, the Brother's Grimm and Arabian Nights. After his work for Disney in 1941, he returned to Denmark. Unfortunately publication tastes had changed and Nielsen's work was no longer in fashion. He lived in poverty in his later years. His work is now celebrated as one of the pillars during the Golden Age of Illustration. Important Changes Happening this Month! We are process of creating a new home for the Art Bead Scene and it will be finished next week! Don't worry, you'll be able to find us at ArtBeadSceneStudio.com now and always. The best thing about our new website will be our reader gallery where you can directly upload your entry this month to our site! We'll post directions and details as soon as the new site is revealed. We will no longer do the monthly recap since you'll share your photo and links directly here on our new gallery. Upload your photo to our new photo gallery (details coming next week!) Please add the tag or title AUG ABS to your photos. 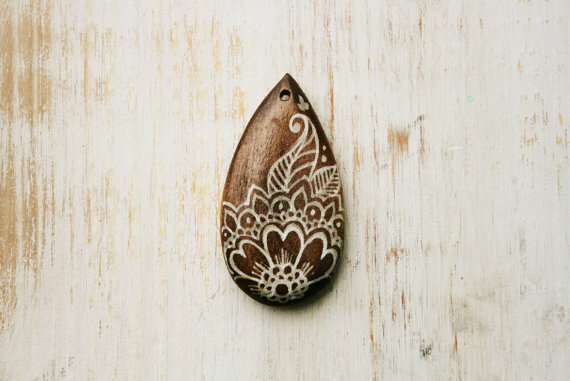 Include a short description, who created the art beads and a link to your blog, if you have one. Art beads must be created by you and fit the Art Bead Scene's monthly challenge theme. They can be made for the challenge or ones you have made before. Two entries per month are allowed. • Winners will be randomly chosen from all the qualifying entries on September 1st. Join us tomorrow to see our prizes and sponsors for August!